These bushy-tailed critters are not a new thing for anyone who lives in Miami. Squirrels can be seen just about anywhere, scurrying up trees, burying nuts, and sometimes even in our homes. If a squirrel takes refuge in your home, it’s most likely because they’re looking for a dry and warm place to keep their babies safe. Anywhere that’s shielded from wind, rain, and extreme temperatures is an ideal place for a squirrel. If squirrels get in your home, whether it’s through openings in your roof or by other means, it can mean a lot of damage to your house. Once inside, squirrels will use anything they can get their little paws on to make a nest, including paper, garbage, attic insulation, and even your belongings. They will also venture out for food, sometimes bringing a variety of nuts or other meals into your home, or searching for it in your kitchen. Not to mention they’ll use wherever they’ve shacked up as not just a nest, but a bathroom as well, which will leave a terrible smell that can be hard to eliminate. Humans and squirrels live in close contact, especially in Florida. People think these critters are cute and like to feed them, so squirrels have almost become reliant on humans for food and shelter. Especially in the hot Florida summers or the cooler nights in winter; squirrels like to have a home where the temperatures don’t get too extreme either way, so they turn to your home. Although squirrels can be a great nuisance inside your home, around your home, they are quite helpful. Squirrels are an important part of the ecosystem; eating bugs like beetles and grubs that can be damaging to your home or foliage. Squirrels can act as guardians of your garden. But as soon as they enter the threshold of your home, they become more of a danger than a help. If you’re dealing with squirrels in your home, don’t fret. Call Critter Control® Miami to help remove them from your house. 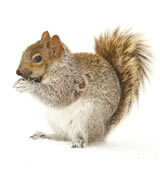 Our experts know exactly how to quickly and safely remove squirrels from you home, and keep them out. For questions, or if you would like to schedule a free consultation, call us today at 305-258-3587.